Looking at the wee collection of photos I have, it wasn't a profitable trip....not that we didn't have a good time, we did,,our decision to go back, not likely??? We have been disappointed in RedStreak campground before, depending on site you get....previous sites were very crowded, cramped and noisy......Redstreak is a popular campground due to the fact it is close to the hot springs. There is a walking path from one end to the springs, this year not advised due to bear activity. The loop we were on was on the edge of the campground against a large range of countryside resulting in quite a bit of activity...We had a flock of wild turkeys roaming through the sites every evg. They certainly were not concerned with campers, kids etc. Then further on in the dusk there were the prettiest deer that wandered through the trees on the edge of the grounds...There were a little more elusive ....Blended into the landscape and lights very well, easy to miss. Our evening walks were quiet, the landscape quite dry and barren...only the hardy brushes survive in this climate. Overlook from Redstreak, Columbia wetlands. Ruth and I came to the conclusion there isn't the attraction that we enjoy at Radium, the hikes?? Im sure they are there, maybe it was the end of year and after a busy enjoyable year, maybe it was just time to relax? Looks like they had a fire a couple of years ago, we found it interesting how the flames leave a track in the trees just as the fire burns....actually reminded me of wind in the wheat fields. And it is September high in the hills. Ruth and I talked about doing this hike earlier in the year. We were going to attempt on our last holiday and were just to tired and wanted to give this day our fullest. And we needed full effort, Fitbit recorded 16701 steps. 107 flights of stairs and 8 K.!! My phone has a app that records steps and it recorded 19265 steps...either way it was a slog. Next day thoughts, I am not sure we need to push as hard. I am sure especially in that heat, if we went a little easier, it would be much more enjoyable. Brochure states it is at elevation of 2200 M (7150 ft.). A bus takes you up the hill (5 K) to Sunshine Village. $27.00 worth every penny. 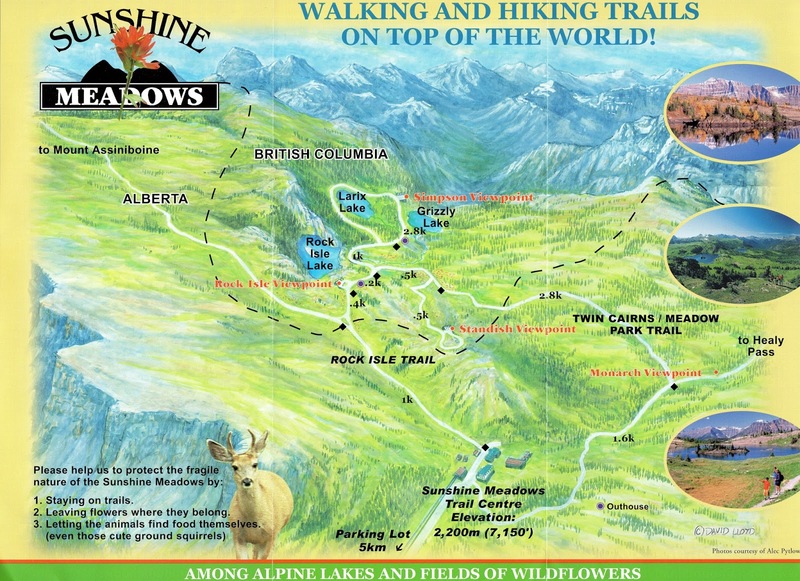 The first leg of the journey is a 100 ft. elevation gain to get you up to the meadows. Our first glimpse of the meadows and after that first slog, more up! breeze on a very hot day..
you descended the breeze disappeared . Flowers were just passed their prime, although the further up and into the trees, it was a whole different world. I can't decided which view is more beautiful....so they both get included in my blog! It wasn't until you looked at the distant hills that you noticed the smoke. There was only a couple of time the breeze brought in the smell of smoke. Most of the time you would just catch a whiff. It appears Mt. Revelstoke does not have all the wild flowers....The higher up they were not as far advanced as downhill.....Beautiful....We must go at the end of July! Backside of Lake, original viewpoint is upper right. Are we not blessed to be living in this part of the world.....Seems to me we have already won the lottery. Can you imagine the harsh conditions these ladies have to survive in? First glimpse of Grizzly Lake. At this point I had reached my limit....All I could think of was we had to get back to the last bus and I was getting slower. I always have to have a beautiful spot for reflection in each trip...This was it....although after about 20 min. of beautiful silence listening to the wind in the trees. (nothing like that sound) a thought niggled in that this probably wasn't the smartest thing we had ever done. I remembered there was a grizzly spotted in the lakes area. All turned out well.. I often feel badly that I hold Ruth back. She is so good at going my speed but her endurance is much better than mine.....Incentive! At least we are out there and doing our (my) best. I thought this was Grass of Parnassus........I don't know! All flowers tuck themselves into little nooks and cranys for protection. I loved this little gem. Have no idea what it was and I think it was the only one I saw. On the last stretch back to Rock Isle Lake...Parks Canada make it easier for people like me! Thanks Ruth for the great day......Next year?